What's your favourite zucchini/courgette dish this year? I'm still harvesting a good-sized zucchini or two every few days, and here's my favourite zucchini dish of 2012 (another recent favourite is this courgette/zucchini cake with lemon frosting, but as one is sweet and the other savoury, I believe I'm allowed to have two favourites :)). I spotted this idea in the May 2009 issue of the British food magazine Olive, but there was too little cheese and too much zucchini in the original recipe, so I've been playing around with it quite a lot. 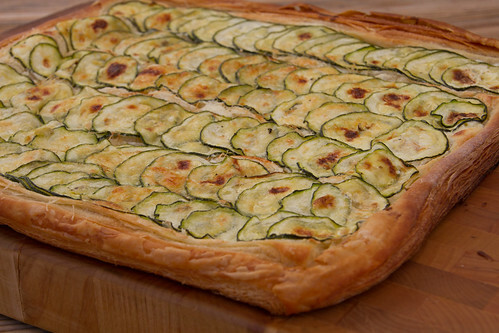 The tart has been a real hit with everybody who has tried it (just look at the number of comments on my Estonian site), and I can see why - the cheese, garlic and courgettes work together immensely well. Use a slim and crisp zucchini for this - both for the looks and the texture. Preheat the oven to 200 C/400 F. Line an oven sheet with a parchment paper. Slice the courgette thinly (I use my Benriner Japanese kitchen mandoline for this), peel the garlic cloves and slice thinly as well. Place into a bowl, season generously with salt and pepper and herbs (if using), drizzle with olive oil. Toss gently to combine and leave to macerate for 10-15 minutes. Roll out the puff pastry. 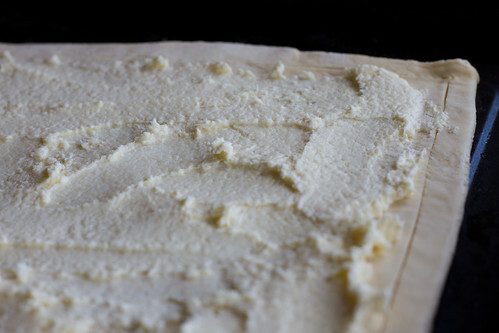 Using a sharp knife, score a border about 1-1.5 cm from the edge of the pastry. Transfer the puff pastry onto the baking shet. Mix the cream cheese with half of the grated Parmesan cheese, spread the cheese mixture onto the puff pastry (stay withing the cut you made). 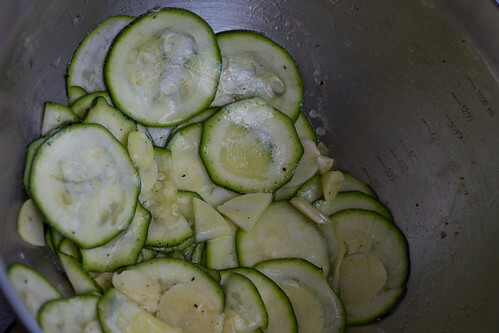 Layer the zucchini slices neatly on top of the cheese mixture, overlapping them as you go. Bake for 15 minutes at the pre-heated oven. Take the tart out of the oven, sprinkle the rest of the Parmesan cheese on top, and return to the oven. Bake for another 15 minutes or until the tart is lovely golden brown on top. Cool a little and cut into small squares. 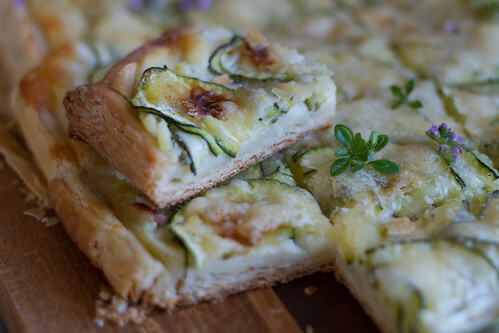 I like the idea of cream cheese and parmesan combined with zucchini and pastry. Excellent idea. Saw you on FoodBlogs.com. 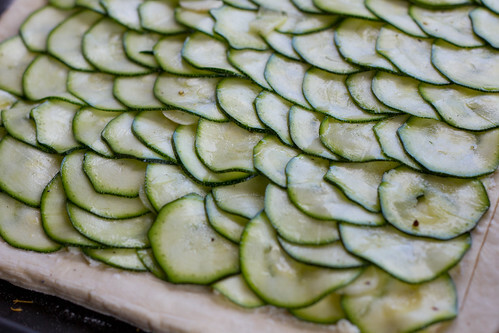 What an elegant way to use up zucchini. I am definitely going to try that! Alanna, simply make these on Friday - they'll still delicious on Saturday! Great vegetarian recipe. Looks very delicious and its probably healthy too :) Good luck. It looks scrumptious. I will definitely be making it. Thanks for sharing. Got zucchini? This looks awesome!